allbeauty is a fairly young company, but it has a reputation and stature beyond its years. Having started in 2004, it wasted no time in stocking its website with the top beauty products consumers wanted, as well as introducing the buyer to emerging gems. Today you’ll find over 14,500 products on the website and a fistful of Which? Best Online Retailer awards, a testament to the amazing growth and success of the allbeauty brand. Everything you need to succeed in the world of beauty is here, with swoon-worthy fragrances, soothing skincare products and makeup and haircare ranges that’ll leave you feeling as good on the inside as you look on the outside. Both men and women are catered for here so everyone has the opportunity to come away with something that’ll make them smile. Plus, if you’re looking for the latest news from this exciting world, the allbeauty blog has everything you need! How do I use my All Beauty promotional code? 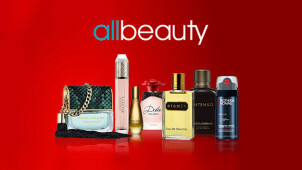 Check out allbeauty’s offers section for some amazing savings! Can I get free delivery with allbeauty? Yes, spend over €40 and it’s yours. Is there an allbeauty outlet? There is, you’ll find it right here. Always great for a saving! How can I pay at allbeauty? You can pay with Visa, PayPal, Mastercard and AmEx. You can return your purchase within 60 days of receipt to receive an exchange or refund. Item must be in original conditions and packaging. Please include a note explaining why you are returning your items. Some items are excluded from this policy, see here for more details. Let your beauty shine with the incredible selection of products at allbeauty. Whatever you’re looking for, there’ll be something here to make you smile so sit back, select your items and get ready to shop happy. Purchase with an all beauty discount code from vouchercloud and you’ll save on your next purchase - after all, who says feeling amazing should have to cost you the earth? With all sorts of hidden gems nestling amongst your favourites, all beauty is the place to be! People have sought amazing scent for thousands of years - in fact, the first ever recorded chemist was a female perfume maker called Tapputi, as reported on a Mesopotamian stone tablet that dates back to around 1200BC. Using flowers, oil, calamus and other natural ingredients, she filtered and distilled some of the earliest perfumes we know of. Think of her when you browse the fragrance selection of allbeauty! As the old saying goes, you should treat your hair the way you’d want to be treated, so give it a dose of the best products from allbeauty. With everything from top of the line shampoo and conditioner combos to styling fudge and curl cream, this section has it all and shopping with an all beauty promo code from vouchercloud means it can all be yours for less.